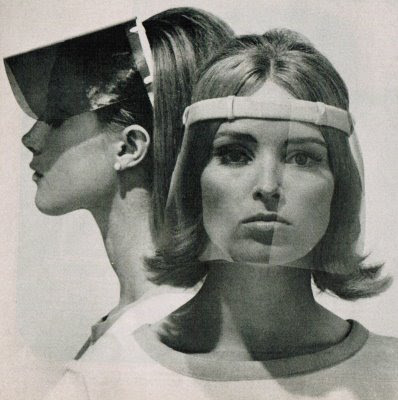 From Life magazine, June 4, 1965. 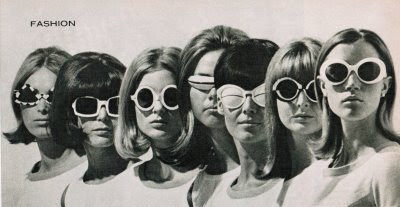 From left to right, Liberty inverted triangles, Riviera (inspired by the shape of TV screens), May Co ovals, Boy Watchers solid plastic band with a strip of see through plastic, Courreges white plastic goggles, Harlequin circular op art frames, and aviator goggles by Riviera. 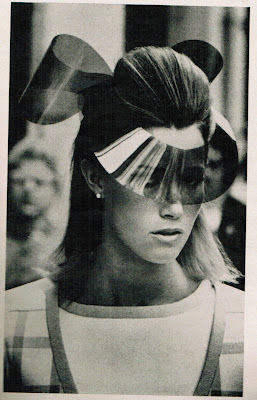 More Halston welder's shield inspired sun shields, using colored plastic attached to headbands with tie with ribbon under the hair. Made to order, $40. 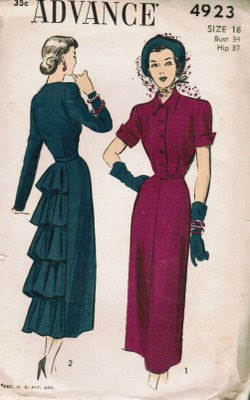 How to use a vintage unprinted sewing pattern. Do those unprinted patterns scare you? They shouldn't -- there are just a few rules to keep in mind when using them. Once you get it down, you'll wonder why you ever avoided them! The large triple perforations are also used for cutting, but they are always laid on a fold of the material-- a lengthwise, crosswise, or bias fold. Before you pin your pattern on your material, it is advisable to take a ruler or tape and measure, to be sure the crosswise grain line is the same distance from the selvedge at each group of perforations. Small double perforations are used to mark the natural waistline in dresses, blouses, coats, etc. In some cases, they are also used to indicate the elbows or outlines of the neck, and are sometimes also used in other special cases. Large single perforations, or small single perforations, either alone or together, are used for different purposes, and their purpose is always marked in the Deltor. part, rip the seams as required, and rebaste to fit. of the good, and, of course, except those that have the "let out" or "outlet" allowance. In basting the garment the seam lines must be followed exactly. If you make any seam deeper or narrower, you alter the size of the garment. Darts are marked by V shaped lines of perforations. A dart is made by bringing the two lines of dart perforations together and basting through the perforations. The line of basting a dart should follow the center of the perforations. Be careful to avoid a pouch effect, a sort of pucker, something that is seen at the end of a badly sewed dart. Notches are to be used at seam edges to show which edges should be joined. Edges marked with notches are put together with the corresponding notches matching. Sounds easy? Now get sewing!